Marie Allen (Eleanor Parker) has had a tough break. At only, seventeen, she’s ended up in prison through no fault of her own. Her husband lost his job, they fell on hard times, and he turned to petty theft to make ends meet. He was killed in the last hold up that only netted him $40 and Marie is in prison as an accessory. “Five bucks less and it wouldn’t be a felony,” the attendant tells her as she’s being admitted. On top of that, during the prison physical she discovers she’s two months pregnant. Tough break, indeed. 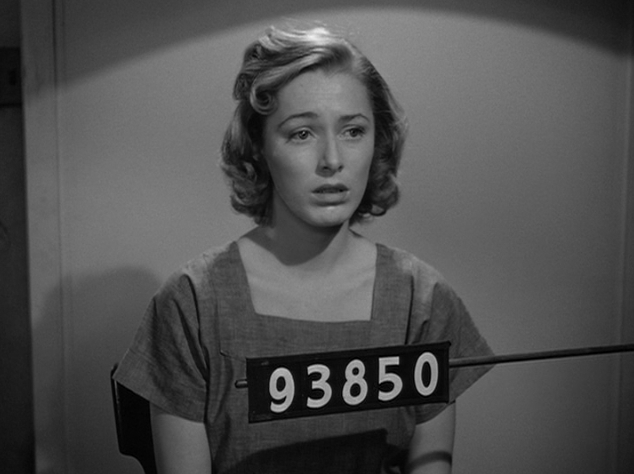 “Caged” (1950) from Warner Brothers is the story of how Marie turns from first timer to hardened inmate and likely repeat offender. It’s an issue film dealing with how prison conditions of the day failed to reform petty criminals but only served to give them an education in crime. Things actually start out pretty well for Marie. Before being thrown into the large cell she shares with 59 other women she meets with the prison superintendent played by Agnes Moorehead, a good fifteen years before she portrayed Endora on TV’s “Bewitched”. Agnes Moorehead is what first drew me to want to give this film a look. I remember her when she was part of Orson Welles’ Mercury Players, portraying Charles Foster Kane’s mother in “Citizen Kane” and Aunt Fanny in “The Magnificent Ambersons”. Superintendent Benton is very sympathetic to Marie, making it clear to her that they’re not there to punish her, “Just being here is punishment enough,” but rather to reform her, to make sure she doesn’t end up back there. Seeing that Marie is pregnant, she assigns her work in the laundry which shouldn’t be too taxing. Her next meeting doesn’t go quite so well, when she is introduced to the matron who takes care of the women in her cell. Matron Evelyn Harper (Hope Emerson) has a room next to the women’s corridor she oversees in which she displays all the “little presents from my girls” including an embroidery sampler that reads “To Our Beloved Matron”. Yeah, right. Harper is a real piece of work. After offering Marie the comfy chair and a caramel, she questions her over her family’s finances trying to get an idea if she’ll be able to afford some of the extras that she supplies as a “service”. When it’s clear that Marie won’t be able to offer her any bribes she puts her to work scrubbing the floor of the cell, with lye no less. But Marie thought she was supposed to work in the laundry, she tells Harper. You’ve got another think coming Marie. Benton doesn’t run this place, Harper does! The prison is peopled with a great collection of characters some looking to help Marie but most just looking out for number one. One of my favorites is old-timer, Millie (Gertrude Hoffman), who gets word to the warden when Harper sets Marie to scrubbing floors. “I’m a tall weed in the grass and the grape vine’s bloomin’.” Harper finds out who squealed and goes to slap her but Millie backs her down with a withering look. “Lay a hand on me and I’ll put your lights out. I’m in for life. One more like you is just so much velvet.” Dialog like that is one of the joys of watching this film. There’s cell-mate Kitty (Betty Garde) who recruits girls on the inside for a shoplifting syndicate. Kitty is one of the good ones but she is still there to tempt Marie with the easy way out. The syndicate will make sure that Marie gets early parole if she works with them when she gets out. At one point, Kitty is auditioning candidates for the shoplifting syndicate. Marie gives it a try on a dare and is surprisingly adept. She stares in horror at the soap she’s swiped in her hand, which was supposed to stand in for the goods, as if she’s staring at her future. Then there are the petty functionaries from the state who have their own ideas about how to handle criminals and who restrict what Superintendent Benton can do. There’s a great scene where Benton gets a visit from one of these functionaries when he comes to complain about the state of the prison’s medical facilities. Benton lays the blame on the state board which only granted her $8000 instead of the requested $80,000. Benton would like to do more to rehabilitate her girls and give them a chance to make it when they’re released. She pleads for more money to get teachers and a staff psychiatrist. “Now don’t tell me your inmates fell in love with their grandfathers’ bicycles when they were little,” is his reply. Priceless. Later we meet Elvira Powell (Lee Patrick), queen of vice, who is thrown into prison for a short stint on a trumped up charge. She’s a direct rival to Kitty for control of the prison and she’s got her own syndicate on the outside for which she’s recruiting. But she’s also got her eye on Marie for other reasons. While celebrating Christmas, Elvira makes presents of lipstick for all the girls. Elvira makes a special gift to Marie of a heart shaped compact. Marie refuses the gift saying “Rhinestones are phony.” “You can have real ones any time you change your type,” Elvira shoots back. And that’s about as blatant as the lesbian undertones are going to get thanks to Hollywood’s production code. There’s a lot more to this drama, stabbings, suicides, riots, forced head-shaving, (yes, that’s a thing) but what really makes this movie stand out for me are the little things. Like when a train goes by the prison with its whistle blowing, the girls all stop what they’re doing and listen to it wistfully. (Paging Johnny Cash!) When in the beginning, one of the girls coming into the prison with Marie recognizes a friend on the inside, she enthusiastically shakes her friend’s hand. Her friend then wipes her hand on her dress like she’s not sure what she might have just caught. “Ahh, no guy’s given me a tumble in months,” she replies. Wow. I’m not even sure what that means but I like it. In the end, when its Elvira’s last day before getting sprung, Marie has a choice to make. Will she take Elvira’s offer of help and get early parole and therefore be indebted to Elvira or will she stay in stir and take the long way out. Millie makes a great speech at this point, trying to convince Marie that a life of crime is no life at all. “I’m giving it to you straight. Wait a year on dead time. But get a legit job slinging hash. Then get a good guy. Have a kid. What I’d give for a sink full of dirty dishes.” Unfortunately, it’s at this time that a group of women are being led through the prison to get an eyeful of the deplorable conditions that Benton has been fighting to improve. One of them, dressed in a fur and expensive jewelry stares through the bars at Marie and Marie stares back, the camera following Marie’s gaze as she eyes the woman from head to foot. After the woman walks away, Marie turns and walks right over to Elvira’s bed. She picks up the rhinestone studded compact she had earlier rejected and carefully applies lipstick as Elvira looks on, smiling. During her last meeting with Benton before she’s released it’s clear that Marie has gone over to the dark side. Benton knows the job she’s got waiting for her is just a show and that she’s likely to turn to crime when she gets out. She tries to talk Marie out of it but Marie is having none of it. “From now on, what’s in it for me is all that matters. You did your best and where did it land you? You can’t lick the system.” As she walks out the door she throws back, “For that forty bucks I heisted I sure got myself an education.” And how! The last we see of Marie she’s walking through the gates to “free–side” and getting into a car with some pretty unseemly characters. Cut back to Benton’s office. “What shall I do with her file?” Benton’s assistant asks. “Keep it active. She’ll be back,” she replies. Warner Brothers has made “Caged” part of their Cult Camp Classics Collection in the same volume as Joan Crawford in “Trog” (Crawford discovers a troglodyte) and Lana Turner in “The Big Cube” (Turner’s stepdaughter doses her with LSD and she ends up in a mental hospital.) Honestly, I haven’t seen either “Trog” or “The Big Cube” but I have to think it’s doing “Caged” a disservice to put it in such company. When Caged was first released it was much better considered. This was no women in prison B–movie. This was an Oscar contender, garnering nominations for Eleanor Parker and Hope Emerson, and a nomination for Best Story and Screenplay (separate from the Best Story and Best Screenplay categories. Huh?) That year Judy Holliday in “Born Yesterday” beat out Eleanor Parker for Best Actress. That I understand. But I don’t see how Josephine Hull in “Harvey” beats out Hope Emerson for Best Supporting Actress. Emerson is great in “Caged” and a great reason to check out this classic. “Caged” really deserves to be considered a great film noir loaded with wonderful characters and juicy dialog.